When an Army trucker goes AWOL before her third deployment, she ends up sleeping in Central Park. There, she meets a Vietnam vet and widower who inherited a tumbledown Borscht Belt resort. Converted into a halfway house for homeless veterans, the Standard—and its two thousand acres over the Marcellus Shale Formation—is coveted by a Houston-based multinational company. Toward what end, only a corporate executive knows. With three violent acts at its center—a mauling, a shooting, a mysterious death decades in the past—and set largely in the Catskills, The Standard Grand spans an epic year in the lives of its diverse cast: a female veteran protagonist, a Mesoamerican lesbian landman, a mercenary security contractor keeping secrets and seeking answers, a conspiratorial gang of combat vets fighting to get peaceably by, and a cougar—along with appearances by Sammy Davis, Jr. and Senator Al Franken. All of the characters—soldiers, civilians—struggle to discover that what matters most is not that they’ve caused no harm, but how they make amends for the harm they’ve caused. 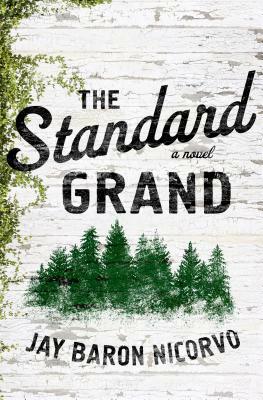 Jay Baron Nicorvo's The Standard Grand confronts a glaring cultural omission: the absence of women in our war stories. Like the best of its characters—who aspire more to goodness than greatness—this American novel hopes to darn a hole or two in the frayed national fabric. JAY BARON NICORVO lives on an old farm outside Battle Creek, MI, with his wife, Thisbe Nissen, their son and a couple dozen vulnerable chickens. His writing has appeared in Salon, Poets & Writers, and The Believer, and has been featured on NPR and PBS NewsHour. He’s published a poetry collection, Deadbeat, and served as an editor at Ploughshares and at PEN America, the literary magazine of the PEN American Center. He was membership director for the Community of Literary Magazines and Presses [clmp], and he’s a sometimes teacher at Western Michigan University, where he helps advise the journal Third Coast.